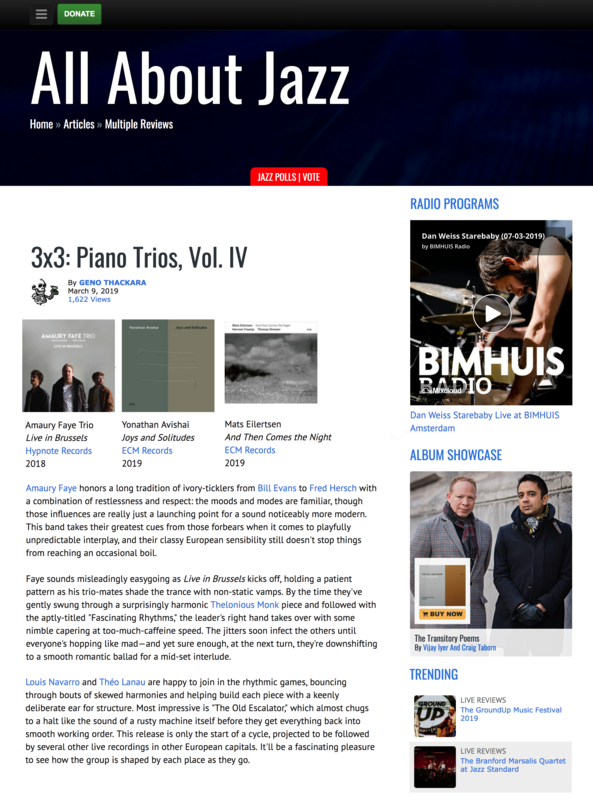 Live In Brussels (Hypnote Records - 2018) garnered one more review from the USA via website All About Jazz. Article written by Geno Thackara. "Amaury Faye honors a long tradition of ivory-ticklers from Bill Evans to Fred Hersch with a combination of restlessness and respect: the moods and modes are familiar, though those influences are really just a launching point for a sound noticeably more modern. This band takes their greatest cues from those forbears when it comes to playfully unpredictable interplay, and their classy European sensibility still doesn't stop things from reaching an occasional boil. Faye sounds misleadingly easygoing as Live in Brussels kicks off, holding a patient pattern as his trio-mates shade the trance with non-static vamps. By the time they've gently swung through a surprisingly harmonic Thelonious Monk piece and followed with the aptly-titled Fascinating Rhythms, the leader's right hand takes over with some nimble capering at too-much-caffeine speed. The jitters soon infect the others until everyone's hopping like mad—and yet sure enough, at the next turn, they're downshifting to a smooth romantic ballad for a mid-set interlude. Louis Navarro and Théo Lanau are happy to join in the rhythmic games, bouncing through bouts of skewed harmonies and helping build each piece with a keenly deliberate ear for structure. Most impressive is The Old Escalator, which almost chugs to a halt like the sound of a rusty machine itself before they get everything back into smooth working order. This release is only the start of a cycle, projected to be followed by several other live recordings in other European capitals. It'll be a fascinating pleasure to see how the group is shaped by each place as they go.